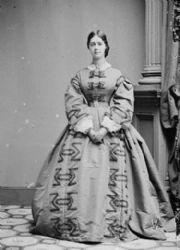 Daughter of Secretary of the Treasury Salmon P. Chase, Kate Chase Sprague married Rhode Island Senator William Sprague during the Civil War. She was beautiful, charming, precocious, a leading social figure in Washington at 19, and a top political aide to her father until his death. Kate wasn’t beyond trying to influence the President himself, writing him in February 1863: “Allow me to offer a modest but earnest plea in favor of Genl. Julius Stahel. That the name of so brave a soldier so faithful a General & so careful an observer of all the Laws — (both Military & Civil) — which should govern a man with such responsibilities, shall not be dropped from the List of those who are to have their respective services rewarded by the Senate.”10 Stahel received his promotion to major general a month later. 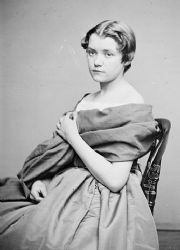 Kate was continually ambitious for her father — acting as his de facto campaign manager for the 1868 Democratic presidential nomination. Chase often seemed to maintain a better relationship with his son-in-law than Kate did. Kate herself put her father’s interests above those of her husband. Her relationship with husband William Sprague was rocky even before they married. Sprague cut off the relationship at one point when he learned of her prior relationship with a married man. The relationship fell apart over their mutual infidelities in the 1870s. She died a broken woman. Jerrold M. Packard, The Lincolns in the White House: Four Years That Shattered a Family, p. 38. Peg A. Lamphier, Kate Chase & William Sprague: Politics and Gender in a Civil War Marriage, p. 49. Doris Kearns Goodwin, Team of Rivals: The Political Genius of Abraham Lincoln, p. 433. Doris Kearns Goodwin, Team of Rivals: The Political Genius of Abraham Lincoln, p. 339. Michael Burlingame and John R. Turner Ettlinger, Inside Lincoln’s White House: The Complete Civil War Diary of John Hay, p. 97 (October 21, 1863). Michael Bulingame, At Lincoln’s Side: John Hay’s Civil War Correspondence and Selected Writings, p. 67 ((Letter from John Hay to Charles G. Halpine, October 24, 1863). Doris Kearns Goodwin, Team of Rivals: The Political Genius of Abraham Lincoln, p. 195. Doris Kearns Goodwin, Team of Rivals: The Political Genius of Abraham Lincoln, p. 19. Doris Kearns Goodwin, Team of Rivals: The Political Genius of Abraham Lincoln, p. 398. Abraham Lincoln Papers at the Library of Congress. Transcribed and Annotated by the Lincoln Studies Center, Knox College. Galesburg, Illinois. (Letter from Kate Chaseto Abraham Lincoln, February 17, 1863). Doris Kearns Goodwin, Team of Rivals: The Political Genius of Abraham Lincoln, p. 542. Peg A. Lamphier, Kate Chase & William Sprague: Politics and Gender in a Civil War Marriage, p. 53. Peg A. Lamphier, Kate Chase & William Sprague: Politics and Gender in a Civil War Marriage, p. 58. Michael Burlingame, editor, Dispatches from Lincoln’s White House: The Anonymous Civil War Journalism of Presidential Secretary William O. Stoddard, p. 191 (November 16, 1863). Peg A. Lamphier, Kate Chase & William Sprague: Politics and Gender in a Civil War Marriage, p. 60. Peg A. Lamphier, Kate Chase & William Sprague: Politics and Gender in a Civil War Marriage, p. 64. Michael Burlingame and John R. Turner Ettlinger, editors, Inside Lincoln’s White House: The Complete Civil War Diary of John Hay, p. 111 (November 12, 1863). Doris Kearns Goodwin, Team of Rivals: The Political Genius of Abraham Lincoln, p. 638. Doris Kearns Goodwin, Team of Rivals: The Political Genius of Abraham Lincoln, p. 639. Doris Kearns Goodwin, Team of Rivals: The Political Genius of Abraham Lincoln, p. 402 ( Letter from Salmon P. Chase to Kate Chase, October 25, 1861). Thomas Graham Belden and Marva Robins Belden, So Fell The Angels p. 30. Frederick J. Blue, Salmon P. Chase: A Life in Politics, p. 185.